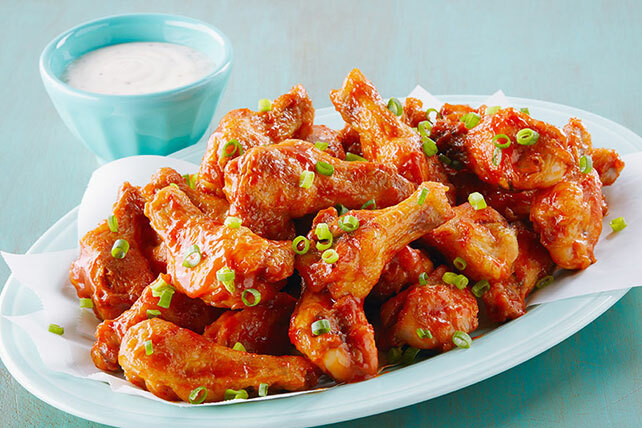 Love Buffalo wings? Toss chicken drumettes in the slow cooker with BBQ sauce and ranch dressing and enjoy this party dish when you get home. Combine first 3 ingredients in slow cooker; cover with lid. Cook on LOW 6 to 7 hours (or on HIGH 4 to 5 hours). Use slotted spoon to transfer drumettes to platter. Discard sauce remaining in slow cooker. Sprinkle drumettes with onions. Serve with dressing for dipping. For an added kick, drizzle 2 Tbsp. hot pepper sauce over the drumettes just before serving. For crispier skin on the cooked drumettes, spread them onto a broiler pan, then broil, 6 inches from heat, 2 to 3 min. or until crisp. Substitute KRAFT Blue Cheese Dressing for the ranch dressing.